In the late '80s, the next step for a successful staff engineer at a commercial New York recording studio was to become a freelance engineer. To accomplish this one needed a regular clientele. I began engineering low budget sessions at Platinum Island within a month or two of bring hired as an assistant. Ironically, the first project they turned me loose on involved a therapist who made tapes intended to reprogram the victim's (patient's) habits in a floatation tank through binaural cross-synchronization. He would tell two stories that were hard panned left and right to the extreme sides of the stereo field. Now and then a word from the left story would subliminally connect with a word from the story on the right imparting subconscious messages like "DON'T DRINK" or whatever subject was being covered, there were a number of them. The subject's deep relaxation in the floatation tank would help the message sink in that much better. It was ironic for two reasons - I had heard of floating, but hadn't tried it, yet within a year I would have a tank at home and become an enthusiastic long time user. The second irony was that the therapist seemed in urgent need of his own techniques. An Otari 8 track recorder with dbx noise reduction was rolled in the control room, a poor cousin to the majestic Studer A80 24 track recorder that normally assumed the duties. The New York studio training system was highly disciplined and rigorous; a great apprenticeship. I didn't realize how disciplined it was until I started working in studios outside of the City. An assistant engineer in a state-of -the-art recording facility in New York is expected to be fully aware of what's going on at all times down to the smallest detail - how many tracks are open, is the recording level good, does it sound good, at what number does the second chorus start at etc. etc. etc. to such a degree that if the main engineer were to suddenly drop dead, the assistant would be able to jump into their shoes and seamlessly continue. The assistant engineer knows the room inside and out, knows which gear is a little funky or which hidden audio weapons sound great and isn't reluctant to suggest them when appropriate. She is the liaison between the client and the studio. Assistants make the studio work allowing the engineer, producer and musicians to maximize their creativity. Assistant engineers started getting credited as second engineers because that's what they did, a second engineer on the session backing up the main engineer, always observing and looking out for mistakes or oversights while also making sure the musicians and producers are comfortable and have what they need. Assistant/second engineers are invaluable to the process of making a record. As mentioned, I began assuming the first engineer post from time to time almost as soon as getting hired on staff at Platinum Island. Not only with the low budget projects which were fairly steady, but also in the higher profile sessions I assisted on. Engineering background vocals for the Meat Loaf Live at Wembley record while producer/engineer Tom Edmonds took leave of the board and produced; engineered all the vocals for Information Society's self-titled release which had a couple of tracks that cracked the top 5 on the Pop Charts and went platinum. A lot of engineering work came through from having done that including mixing a song for Information Society used in the film Earth Girls Are Easy. At a certain point I began experimenting in the recording studio with approaches and techniques that would distinguish my engineering from every other competent engineer out there. I bought a used 1500 watt tri-amped P.A. which I used to reamp sounds in the live room. This was the era of drum machines, triggered drum samples and sequenced synthesizer patterns. The P.A. helped give those sounds some non-linear character. I usually miced the room the reamp was in with a cardiod condenser pair aimed at the corners of the room focused 180 degrees away from the P.A. to minimize the direct sound. Once I did mic the P.A. fairly close with a Neumann FET 47 when Bill Laswell was doing a fretless bass overdub for Anton Fier on a Golden Palominos record. 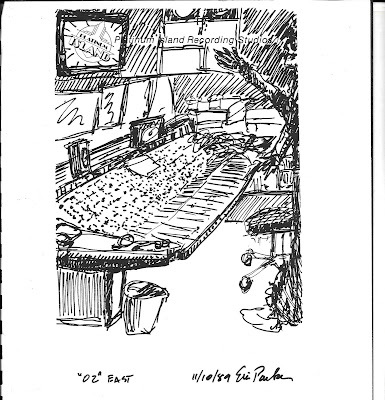 Bill played in the control room going direct into the board with the P.A. functioning as a huge amp for the sound. It sounded good and worked out well. Another series of experiments involved using visual images and graphics in the control room to influence the listening aesthetic in a creative way. John Lilly documents his audio/visual repeating word tape loop experiments in The Center of the Cyclone with the verified conclusion that what you see affects how you hear. I wrote an article for TapeOp magazine, later reproduced in their book, Visual Images in the Recording Studio that covers some of my research in this area. Bill encouraged this and was open to whatever I wished to try so I got permission to take it as far as possible by covering up every possible inch of wall space in the control room for a Bootsy Collins overdub session. I arrived three hours early to set it up and used Tibetan mandelas, art pictures by Max Ernst and Salvador Dali, psychedelic images, graphics from an illustrated Egyptian Book of the Dead and all kinds of other esoteric and fine art pictures. It ended up feeling very intense in there, almost uncomfortably so. You could feel the walls pulsating with light and image producing a natural high, a waking state. I was concerned that I'd gone too far, but the session went quickly and smoothly. Bootsy and Bill didn't seem to mind. Effective invocational recording depends upon setting up a space. Invocation, that aspect of magick concerned with "drawing down from above," in this case music, is a science that has much to offer the creative artist. You could just as easily say that good creative recording depends upon setting up a space. The first thing we learn in ritual magick is to draw a circle which divides the Universe into the area of our working and everything outside of it. Anything not concerned with our objective aim gets banished outside the circle. Similarly, we conceptually draw a circle demarcating the recording studio environment and banish anything not useful to the endeavor including any concerns, worries, or emotional issues about mundane life problems. We want to be fully present in the space, fully receptive to whatever might come through. We learn from J.G. Frazer's research of primitive folklore in The Golden Bough that there appear two basic laws of magic, the Law of Similarity and the Law of Contagion. The Law of Similarity, resonance magic, operates under the principle of like attracts like. Or as E.J. Gold puts it, the model of a thing becomes the thing itself. A space consecrated to ritual or explicitly dedicated to an intentional music session can be called a chamber. We set up a space in the recording studio that appears resonant with the musical aim or resonant with a chamber where all musical possibility exists. This can get done materially (artworks, figurines, statues, incense, lighting etc anything that creates a particular mood), astrally (through visualized imagination) or both. The chamber where all musical possibility exists is also known as 'the crossroads' as in the Robert Johnson legend where he suddenly acquired mastery of the blues. The crossroads legend also got attached to Bob Dylan as, according to peers, he went from being an amateurish wannabe to a talented, charismatic performer within a few months. You can tell in any interview where he talks about his early songwriting process or his own writings that Dylan appeared directly wired to the crossroads chamber, able at any time to access a rich flow of musical content and expression. Every once in awhile we get tangible evidence that the resonance of the space set up in the studio influences the physical world. I was fortunate to assist for a week on overdubs for the first Danzig album produced by Rick Rubin which I've been told is a classic by aficionados. They brought in some occult paraphenalia, I don't remember exactly what, but typical of what many heavy metal/hard rock bands incorporate in their graphics. They also set all the digital readouts, mostly digital delays, to read 666. One night I wore a T-shirt adorned with a large upright pentagram and they told me it was upside down so I think they were going for the darker side of occult iconography. That was the extent to which they set the space, there wasn't any other visible reference to the occult or ritual other than making music. The space didn't feel particular sinister to me though it did create a unique mood. The music was great and everything flowed well. I engineered a session the day after Danzig left. Everything was going well, I'd just finished recording a couple of tracks with multiple drop-ins along the way when the logic circuit of the multitrack remote freaked out, automatically rewound the tape to the beginning then started playing, going into record and erasing the two tracks we'd just finished. Fortunately, I was right there and caught it before any damage was done. The remote was powered down which reset it making it fine again. That never happened to me before or since so I've always been tempted to attribute the logic freakout to leftover reverberations from the Danzig chamber. One of the most powerful shamanistic recording sessions I've engineered, Yothu Yindi in Sydney, Australia was also one of the more elaborately created chambers I've experienced in a recording studio. The indigenous Australians (they consider the term "Aborigines" insulting) brought in a lot of relics, banners, and traditional instruments from their 40,000 year-old culture transforming the Control Room and the live space into a different world. After 10 - 12 hour sessions I felt completely altered and naturally high like after an extended floatation tank session. They didn't have to be told to set up a space, they were experienced shamans and knew that is what you do to tap into the magic, to go to the crossroads. Read this for more details, continued here. One attribute that set me apart as an engineer was that I knew how to set up an invocational space. Another overall approach to becoming a better engineer consisted of fine tuning my brain and nervous system as much as possible for maximum alertness, attention, presence and focus in the studio environment. To this end, I practiced a lot of yoga and did other exercises to increase the concentration of my attention. I experimented with diet though didn't get consistently disciplined with this until later on. Things changed dramatically after purchasing a used floatation tank from my friend, Sam Zeiger. I would float in it everyday for about an hour before a session and get out with sharpened perceptions, able to process information rapidly and clearly; High Velocity. The recording studio is a high energy environment even if it doesn't always appear that way. Every electrical circuit generates a magnetic field at right angles to the electric flow and those fields impinge upon the electromagnetic field that surrounds the human biological machine which has always been regarded by me as the most complex piece of equipment in the recording studio. Staying at the top of your game, being as present as possible in the studio because that's what the job demanded meant that your brain was thinking ahead, anticipating what might be needed next, allowing the flow to go as quickly and smoothly as possible; staying out of the way. Working fast and efficiently is a big plus to clients who are paying anywhere from $1,000 - $2,000 a day just for the room. It's also a big plus to musicians to not get slowed down by technical considerations once they've turned on their creative tap. I remember taking over engineering duties to record horns with Fred Wesley and Maceo Parker for the Bootsy's Rubber Band album Jungle Bass. Everyone was waiting while I set up the song. I put on a pair of "cans" (headphones) and dialed up a headphone mix on the fly taking a second to balance each track, getting it ready in less than a minute. I noticed that Nicky Skopelitis saw the speed it took to get a good balance and pointed it out to Bill Laswell. Previous years of mixing live sound certainly helped there. Going freelance is scary. I recall my friend Knut Bohn's trepidation at the prospect. At the time, Knut worked mostly as Nile Rodger's engineer. It was a prestigious and steady gig, but he was wanting to move on. We had met at the Institute of Audio Research, the recording wing of NYU. Knut dropped out after the first quarter and got an internship at Skyline, a major studio then. I completed the full year of school then moved back to Canada for a couple of years trying, and mostly failing to get studio jobs. One night I got booked to assist a session for Arto Lindsay's group Ambitious Lovers when in waltzes Knut, the engineer I was to assist. He was moonlighting from his Niles gig to fill in for another engineer. At that moment it seemed that one of us had made the wiser career move. We had a good time reconnecting on breaks. Knut graciously invited me to visit him at Skyline where he showed me the new Sony digital multitrack they had with programmable punch in/punch out features and introduced me to his boss. At Skyline we talked about working freelance which we both seemed to view as jumping off a cliff. "The essential aim of High Velocity Sound Engineering is clear aesthetic communication. The information is communicated through the form of music. Music is taken to be a high order language containing the possibility of evolutionary change. The idea to name this operation High Velocity came from Dr. Tim Leary's book, The Game of Life. I understood very little of Syngertics, the little I did seemed valuable. Reading it definitely put me into a different kind of receptive space quite different from what I was used to. At night, there were wild geometrical interdimensional chambers in my dreams of a totally alien kind. I didn't have any noticeable epiphany or tremendous realization with the Mercury workings though only a couple of months later Terry Tompkins enlisted me to record his band The Now Feeling, my first time multitrack engineering an album in a professional studio. It was recorded on an 80 series Neve console at the Columbia School of Recording in Calgary, Alberta. The sessions went great even though I was moonlighting from my live sound gig at night and was getting a little stretched thin; burning the candle at both ends and in the middle. The Neve board sounded amazing. The people who ran the place, Mark Goodman and Lanny were mostly helpful and friendly guides though Lanny started scaring me with warnings about recording the cymbals too loud that would make the record skip. I was dubious of this advice but didn't really know so I called Bernie Grundman Mastering down in LA to get their advice. Bernie himself answered assuring me saying, "hell no, we can take care of it, we get tapes in here to master where the VU meters are pinned and don't even move. Be reasonable with your levels and you won't have a problem." One night in a movie theatre, distracted by paranoid thoughts regarding the uncertainty of income, I flashed back to Buckminster Fuller's story of going independent and how he dedicated himself completely to working for what he called Scenario Universe. He anticipated an effect of precession to support himself and family with their basic needs. By precession he meant a scientific term for a "side effect." though that's a simplification. Basically, he felt that by working for Scenario Universe with great integrity, that Scenario Universe would indirectly provide ways and means to support him and his family. Fuller lived in poverty for a few years but eventually became a millionaire without ever directly trying to make money. This memory eased my worried mind. I felt encouraged and empowered. If I worked for Music always with the greatest possible integrity then my basic needs would indirectly get taken care of. So far, I've been right, knock on wood. A new student of sound recording recently asked me for one piece of career advice. I told him to try to find some idealistic reason or higher purpose for choosing this line of work beyond looking to get rich and/or famous. There's a lot of hard work and long hours ahead so it seems helpful to find enjoyment and reward from the process rather than waiting for a superficial goal that may or may not ever happen. It could be as simple as you just love music and want to see more of it of better quality in the world. Serving in the citadel of Music has turned out well for me. Though unprovable, I suspect the wide diversity and tremendous amount of incredible music and musicians I've been exposed to results from adhering to the vision of the power of music over industry politics and the lust for success and recognition. One turning point to this direction occurred in the early '90's. Bernard Fowler asked Bill Laswell to recommend a mix engineer for an album he was co-writing and co-producing with Ron Wood for his fifth solo album, Slide On This. Bill asked me if I wanted to be considered for this project. The scheduling of it meant that I would miss working on another project that Ornette Coleman was producing. I had only met Ornette, never worked with him. The Ron Wood project would have been much higher profile if I'd been chosen but it had been an ambition of mine to engineer Ornette Coleman since I heard him say in a film that he wanted to make music like Bucky Fuller's synergetic geometry. Jason Corsaro got the Ron Wood gig and did an excellent job, far better than I would have been able to pull off at that time. I got to hear some of it in Howie Weinberg's mastering suite at Masterdisk and it sounded huge. What follows is an interview I recently gave for the Prairie Sun newsletter. The photo is by John Baccigaluppi and the graphic courtesy of TapeOp magazine. 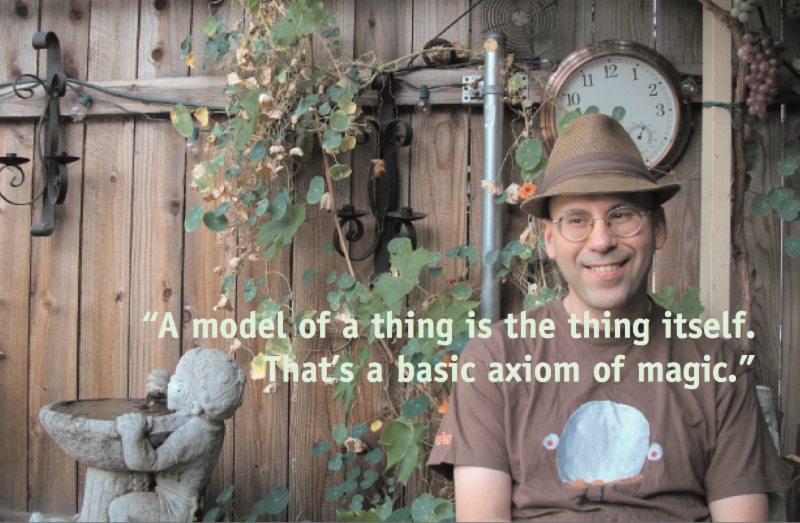 The interview was conducted and assembled by Andrew Mastroni for Prairie Sun Recording. "Tom Waits called me up, introduced himself and said that he needed an engineer for his next record. I believe this was in the spring of 1998. He told me to meet him at Prairie Sun for an interview. I hadn't heard of it before. I got there before Tom and met Mooka for the first time who showed me around. I remember Mooka mentioning that Waits' last record, done at Prairie Sun, had won a Grammy. I thought to myself, 'great, no pressure here...' and silently laughed." Oz's credit list is very impressive and his full discography can not be viewed here. To name a few noteworthy credits, he has worked with Miles Davis, Ornette Coleman, Herbie Hancock, The Ramones, Meat Loaf, Paris Combo, Ginger Baker, Bob Marley, Bill Laswell, Primus, Nataly Dawn, Oysterhead, Tom Waits, Rupa & the April Fishes, Iggy Pop, John Hammond JR., Praxis / Buckethead, Kanaga System Krush. Some noteworthy artists Oz has worked with at Prairie Sun include Nataly Dawn, Tom Waits, Primus, Eric McFadden, Mike Sopko, Thomas Pridgen, KSK, BABX, and Too Noisy Fish. We always knew Oz was a tone master, but didn't realize the regard he holds for music as a powerful humanistic and spiritual force to affect change in the world. How does spirituality and your world views play into your approach to a project and more specifically a mix? "Besides organizing all the technical requirements for a session, I will set up a space in the studio that resonates with the mood of the music's spirit to be recorded or mixed. Music has its own spirit, its own particular mood that you feel when its really working. It's alive in a nonhuman way. I view the recording studio as a special kind of chamber or a 'landing pad' for the descent of this spirit into a musical expression. The same holds true for a mix, you set up a space in the control room that resonates with something higher, the life force of the music. This invocational approach is known as sympathetic magic. The music is viewed as sacred. The recording or mixing session is a special case ritual designed to translate the virtual musical vision of the artist into the material actuality of a reproducible musical form." Over the years we have noticed you request when possible for the artist to provide some visual art for you to reference while you mix we would like to know how this method affects the production. "It contributes to the mood of the space and affects the aesthetics of hearing. It's been demonstrated that what you see affects how you hear so I offer artists the chance to customize the space of the studio environment making it conducive to their musical vision with art, artifacts or whatever. One artist took my suggestion to the extreme and brought in a bedraggled chicken in a cage that looked like it had been wrung through an old fashioned washing machine.."
Do you find that your approach is compatible with all artists and genres or does it best suit certain people or styles of music? "It's compatible with all genres of music, but not necessarily all artists, I've found out. My aim is the effective translation of the artist's vision as opposed to putting any kind of signature stylistic stamp on a production. As a result my approach is compatible with almost all artists. I once worked with a group of people with fundamentalist beliefs who kept complaining about a previous producer they had worked with. I told them that incense could be used to banish all past influence from a space. The next morning they let me know my approach was incompatible with theirs so I voluntarily left the project on good terms. Later, they hired me to do some overdubs and mixing." 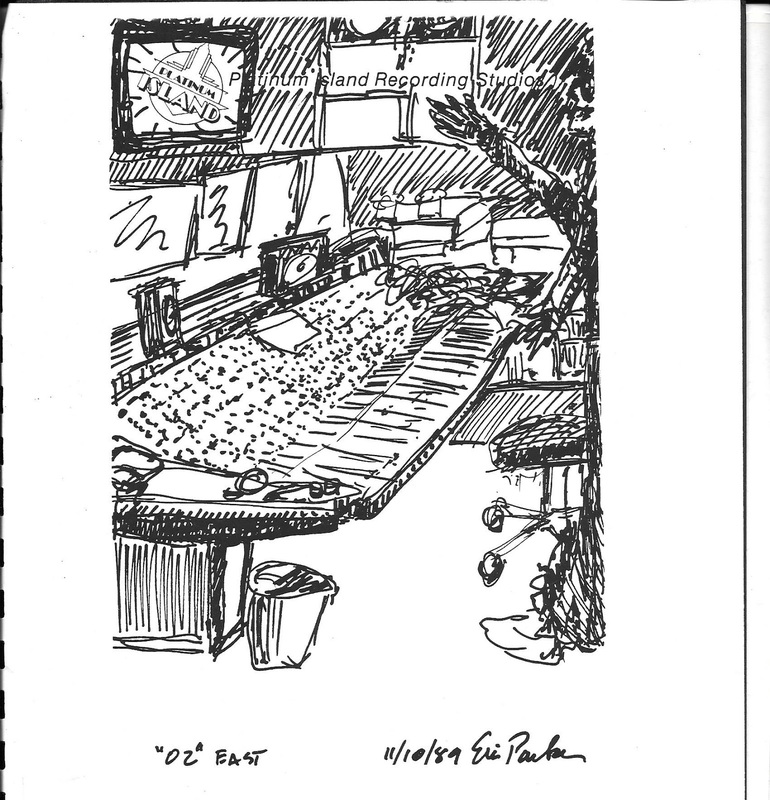 Why do you choose to mix some projects in studio B as apposed to studio A? We have noticed you choose to mix some projects on the Neve with flying faders in studio B as opposed to other projects mixed in studio A on the SSL. What is the criteria for these decisions? "Part of the criteria is how big the projects are, how many tracks in the session files. If it's much more than 24, then I prefer to mix it on the larger desk in Studio A. Also, some projects go for that old school, audiophile sound. Usually the music is more acoustic. Often it will have been tracked on analog and/or they want it mixed down to analog. Studio B has consistently given me outstanding results with those types of projects. Studio A is great for music with a harder edge - rock, punk, even reggae and dub. The SSL provides a more contemporary sound if that's what's wanted. Studio A, with the board and ouboard, has greater resources for refining and sculpting the sound as desired." When you travel out to Prairie Sun to work on a project you usually stay on the property. How does staying in the same location as the artist you are working with affect the project and is there any part of the property of the Prairie Sun staff that influences the production? "Staying on the property has several advantages, for one, you stay more focused on the work. The state of a person's body and mind obviously plays a critical role in how good you can do your job. I always remind my students that the human biological machine is the most complex piece of equipment in the studio. Time normally spent commuting to work can be spent preparing and fine tuning my machine for optimum studio performance. I'm able to get up every morning and go for a jog in the exquisitely beautiful rural countryside around the property to clear my head and get ready for the day. The vibe of the staff and generally of all the other characters that come and go on the property always feels supportive. The staff seems genuinely interested in the music and eager to help or contribute in any way. Everyone seems aligned to a clandestine conspiracy to create great music and thus make the world a better place." The Prairie Sun echo chambers in studio C have been a part of your process for mixing here for years. What about the spaces and the setup helps your productions? Does the Prairie Room or the Waits room have any special characteristics your would like to mention? "Those echo chambers give my productions a unique sound. I know definitely that projects have worked at Prairie Sun specifically due to the sound of those rooms. It's impossible to recreate their sound with any digital reverb, that partially accounts for their uniqueness. They give the mixes a depth that can't be manufactured in any other way. The Prairie Room has a bigger sound and is ideal for drums. The size of that room is adjustable using baffles. The Waits room is probably the ideal small to mid room size acoustic space. It's live, but not huge; great for anything acoustic - strings, acoustic guitars, vocals etc. Also can work well for a snare reverb as well as percussion instruments." You have been using Prairie Sun for 17 years. We would like to know what about this studio keeps you coming back? Why does it work for you and your unique approach? "I've been working at Prairie Sun since 1998 - 17 years. I keep coming back because it has everything I need to record and mix the way I want to. Prairie Sun has all the right audio tools. It has a great combination of vintage and contemporary technology that gives many options for different kinds of productions. The mic selection is outstanding, all the food groups are amply covered. You can't beat a good mic, mic pre combination. The vintage Neve and API mic pres give two excellent choices to make distinctive recordings. There is also something intangible about why I keep returning to Prairie Sun that has to do with the atmosphere and energy of the place. It's always been very comfortable to work there even in high stress situations. And then there's the track record. Every project I do there works, the client's usually happier than their expectations. When the late, great Doug Sax mastered the Jack and the Bear project recorded and mixed at Prairie Sun about 18 months ago he personally emailed to let me know how much he liked the sound of the production. Prairie Sun delivers those kinds of results." When we listen to your mixes there is a certain depth that is hard to pin point where exactly it comes from. Can you speak for a moment on your use of distortion, panning and reverbs, and do these techniques tie into your unique spiritual approach to audio production? The depth comes from the deep end. The reason for using distortion is to introduce nonlinear harmonics and acoustic texture into the sound. The use of error correction in digital recordings tends to make the sound a little artificially smooth to my ear so I try to counter that using analog equipment such as tape delays, plate and spring reverbs, reamping, guitar pedals, overdriven tube equipment etc. For me, it makes the sound more authentic taking it out of the flatness of the mathematically precise digital world by introducing microtonalities and textures. That's part of what gives my mixes added dimension. The depth also seems a result of my approach which uses high attention to detail regarding every moment of the mix like a frame in film. I approach the creation of the soundscape in a mix like an architect aiming to maximize the use of space. When you walk into a cathedral you experience a sense of majesty whether you're religious or not because of the way the space was built, the architecture of it. When you listen to a track I've mixed hopefully you experience the mood of the song in the same way due to the space of the mix you've entered." So begins Mark Seem's introduction to Deleuze and Guattari's Anti-Oedipus - Capitalism and Schizophrenia book one. The blurb on the back from Michel Foucault's preface calls it an "introduction to the nonfascist life." Reporting on the 10% or so of this book I did understand, it seems, on one hand, a complex multifaceted attack on conventional psychotherapy and in particular the tendency to relate all problems back to the family either literally or figuratively using the model of the Oedipus Complex. They contrast psychoanalysis with "schizoanalysis" which seems related to the multidimensional nature of consciousness. Schizoanalysis seeks to remove all repressive programming from the psyche so that a person can be free to follow ones deepest inclinations, to do what thou wilt. Destroy, destroy. The task of schizoanalysis goes by way of destruction - a whole scouring of the unconscious, a complete curettage. Destroy Oedipus, the illusion of the ego, the puppet of the superego, guilt, the law, castration. It is not a matter of pious destructions, such as those performed by psychoanalysis under the benevolent neutral eye of the analyst. For these are Hegel-style destructions, ways of conserving. This all out attack on psychotherapy and the Oedipus model maybe doesn't seem as revolutionary as when the book was published in 1972. Psychotherapeutic models don't appear as all encompassing and dominant in our culture as they did in the '50s, '60s, and '70s when it seem expected that everyone go through analysis. For instance, Israel Regardie, who ended up becoming a Reichian influenced therapist, strongly recommended (in the 1970s) some kind of psychoanalysis before undergoing initiation into the Golden Dawn. Delueze and Guattari repudiate conventional psychotherapy with an intensity reminiscent of Aleister Crowley's war machine efforts against the stifling programming of unquestioned Christian belief and practice. Both of them sought to empower people to shake off the shackles of external Control and programming to become free to find their own voice. Free to engage upon the endless process of becoming, a spiritual awakening that vastly expands experience and capability.... and never stops unless you stop. Perhaps the move away from psychotherapy in underground and esoteric circles (maybe the mainstream too??) has something to do with Anti-Oedipus? It certainly had a strong impact in philosophical circles and it looks like it has contributed to a change in certain cultural elements. Philosophy in its function of causing change to occur in accordance with Will. 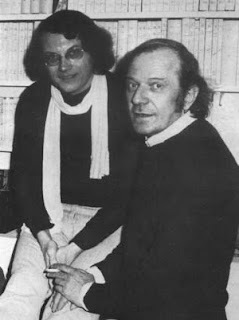 Deleuze and Guattari hold a high regard for pragmatic ideas. An interesting aspect of D & G's writings is that they draw from multiple disciplines and sources outside of philosophy and psychology to present their arguments - literature, theater, music, art, science, archeology, etc. A good example of schizoanalysis in action can be seen in the recurring sections of Mary Lou Cervix's acid trip in Illuminatus! by Wilson and Shea. These occur somewhere in the area of p.650 - 700 in the novel. For those who read the previous blog on the war machine and magick, it appears obvious from the above quote that schizoanalysis performs a war machine task. To be crystal clear, the war machine as we examine it in the context of magick, alchemy and transformation , has absolutely nothing to do with fighting other people on any level whatsoever. It's about the fight to live a nonfascist life, to follow one's bliss, to start up the perpetual motion machine of endless becoming who you are, etc. etc. etc. D & G call this "desiring-production", find out your deepest desires and produce them... do what thou wilt. Schizoanalysis = a method of defiance against the control systems of State and society, the ones that tell you what you're supposed to do and think. Schizoanalysis = solve of solve et coagula, the alchemical formula of dissolution and reformation or what D & G might term deterritorialization and reterritorialization. Like Wilhelm Reich, who shows up a few times in Anti-Oedipus, D & G maintain that psychological factors and the therapeutic models used to treat them strongly influences society in its economic and political manifestations, hence the references to Marx's writings and the subject of Capitalism in relation to Freud and the Oedipus Complex. Schizoanlysis seems about going beyond limits, crossing boundaries, expanding into unknown quadrants but without any specific goal in mind. It's nongoal orientated, or so they say. Like John Lilly, D & G appear very careful not to program the trip though they describe an affirmative, creative philosophy of endless becoming and forging ahead omnidirectionally to make new connections. Completing the process and not arresting it, not making it turn about in the void, not assigning it a goal. We'll never go to far with the deterritorialization, the decoding of flows. For the new earth (" In truth, the earth will one day become a place of healing") is not to be found in the neurotic or perverse reterritorializations that arrest the process or assign it goals; it is no more behind than ahead, it coincides with the completion of the process of desiring-production, this process that is always and already complete as it proceeds, and as long as it proceeds. It remains therefore for us to see how, effectively, simultaneously, these various tasks of schizoanalysis proceed. What they call the process seems identical to True Will.